Caterpillar, Emerson Electric, and Lincoln Electric look well-placed to prosper in the current environment. The industrial sector is known for being cyclical, but as every investor knows, not all cycles are equal. Indeed, events have suggested that there's been a sea change in the way investors should think about the sector. Let's take a look at what that means for choosing industrial stocks. 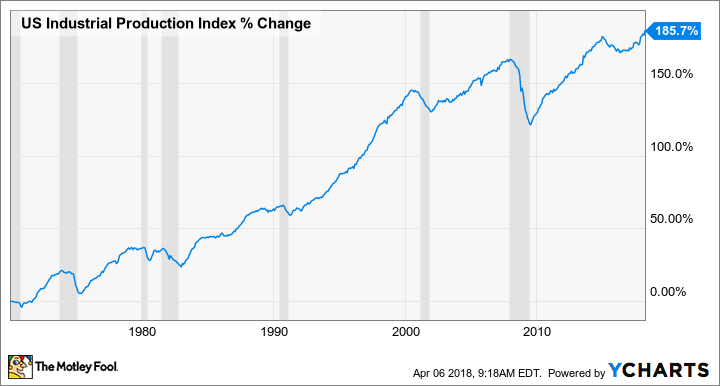 The drop in U.S. industrial production from mid-2015 to mid-2016 was the first time in close to 50 years that there was a significant decline that wasn't preceded by an economic recession. This marks a change in the way investors should think about the industrial sector. US Industrial Production Index data by YCharts. As you can see below, the U.S. industrial recession in 2015-2016 was driven by declines in energy materials and business equipment. Defense and space equipment declined significantly, but (see above) it's not a major part of U.S. industrial production. That's interesting because it implies that the growing importance of energy production to the U.S. economy is making the industrial sector positively correlated with energy and mining commodities. In other words, rising energy prices are not necessarily bad news for the U.S. industrial sector as it used to be. On the contrary, many U.S. industrial companies, including the ones discussed here, will welcome rising energy prices. The good news is that energy and metals prices have been on a general uptrend since the start of 2016; capital spending has started following, as higher prices tend to induce investment. The key conclusion for the industrial sector is that, as long as the trend continues, investors should look for stocks with exposure to energy and mining-related spending. These include process automation company Emerson Electric; construction, mining, and oil equipment machinery company Caterpillar; and welding products and systems company Lincoln Electric Holdings. Data source: Company presentations. Analyst estimates. Buying these stocks right now makes good sense because all three have earnings momentum and therefore are likely to exceed analyst estimates. Caterpillar is probably the best-known of the three -- largely for its iconic construction equipment -- but its mining equipment holds the key to Caterpillar's prospects in 2018. 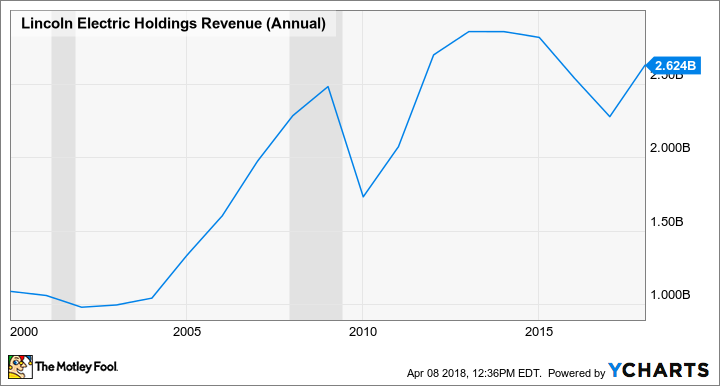 Caterpillar's construction-based profits remain strong (see the positive trend in construction supplies in the chart above), and the energy and transportation segment has also bounced back. But now its mining equipment sales look set to increase significantly, as major mining companies boost capital spending in response to increases in metal prices. Data source: Emerson Electric presentations. . Process automation simply involves turning raw materials into finished products (such as chemicals, oil and gas, or power); Emerson's end markets are in exactly the heavy industries that are bouncing back strongly. As such, the company is set for a good 2018, and has already raised near-term earnings estimates while increasing its midterm guidance. The 2017 acquisition of Air Liquide's welding operations helped boost sales growth to 33% in the recent fourth quarter, but even on an organic basis, sales were up 10%. LECO Revenue (Annual) data by YCharts. Provided the energy, materials, and heavy-industries end markets keep growing, Lincoln Electric is likely to have good future growth. There's no guarantee that energy and heavy-industries capital spending will keep increasing in the future; that's largely a consequence of commodity price movements. But for now, a positive trend is in place. This means stocks like Caterpillar, Emerson Electric, and Lincoln Electric have the potential to surprise on the upside with their earnings in the next year or so. For now, they all look like attractive stocks. Ask a Fool: How Do Different Markets Around the World Correlate to Each Other?